What Instructions Can I Provide My Volunteers? These are the instructions that you'll want to provide to your volunteers when it's time to go live. Depending on if you are importing them or if they should self register themselves, their instructions will slightly change. If your volunteers need additional help, you can provide them with our Signing Up Guides. Not everyone will want to use the mobile app to log their hours and that's completely ok! But for those that do, you can send them to their mobile app store and search for Track it Forward or Volunteer Time Tracking. Just make sure that they know they will need to have an account set up on the web, prior to signing in to the app. And YES, it's FREE to download. 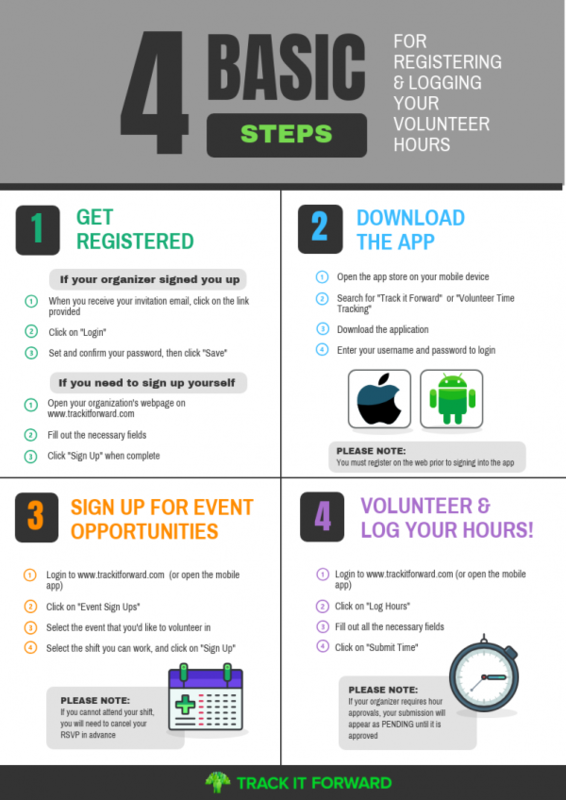 If your organizations use's the Events Calendar, your volunteers can sign up for those events on the web or in the mobile app. They would go to the same place to sign up for or cancel shifts, as well. 4. Start volunteering and logging hours! After an event is over, volunteers can log their hours, again on the web or in the mobile app. If you need want to approve hour submissions, your volunteers will see their submitted time appear as "Pending" until it is approved.